A powerful earthquake of 7.5 magnitude rocked the Indonesian island of Sulawesi on Friday, triggering a 5-feet-tall tsunami which swept away houses in the cities of Palu and Donggala. The death toll reached 384 as the area suffered power outage leading to the grounding of communication networks, The Indian Express reports. Disaster agency spokesman Sutopo Purwo Nugroho said it has been difficult to gather more details as Sulawesi capital city Palu was plunged into darkness and its communication lines were snapped. He said houses were swept away and families were reported missing. Communications to the area were disrupted. “All national potential will be deployed, and tomorrow morning we will deploy Hercules and helicopters to provide assistance in tsunami-affected areas,” he said in a TV interview. The airport in Palu city is reported to be closed. 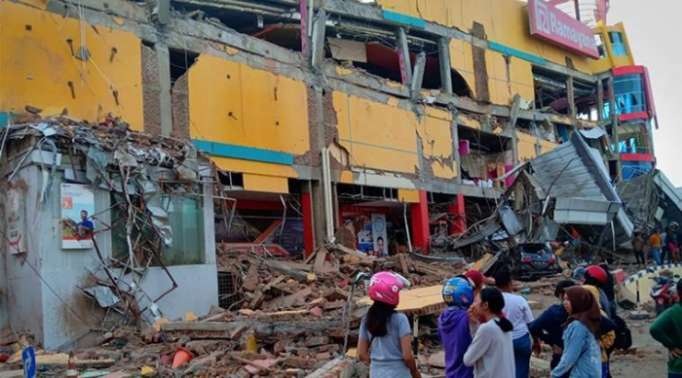 The US Geological Survey said the strongest quake had a magnitude of 7.5 and was centred at a depth of 6 miles (10 kilometres) about 35 miles (56 kilometres) northeast of the central Sulawesi town of Donggala. It briefly triggered a tsunami warning.